Arthur lifted a hand. This time a jet of flames flickered to life from his palm, heading straight for the Kyrii. “Look out!” Zemia shouted, tackling Wiluite out of the way just in time. She grabbed him by the mane, dragging him along until they took cover behind a nearby tree. He was cut off, as Zemia smacked him across the face. She just stared back, giving him a slight grin. Wiluite looked around, Parlebb stood beside him, arms crossed and eyes squinted into a stern look. “Uh…why are you two looking at me like that?” Wiluite uttered. The only response he got was Parlebb pointing in the direction of the corrupted red Zafara. Wiluite gulped. That got his attention. Arthur stirred. “Yeah, you! Who are you? And what have you done with Arthur?” Wiluite screamed at the top of his lungs. Arthur just looked at him. Wiluite’s throat tightened, as if something gripped his neck. He couldn’t talk. The corrupted Arthur raised his hand. Wiluite lifted off the ground. He lurched back his arm, reeling the Kyrii towards him, powerless to resist. Arthur clutched one hand onto the side of Wiluite’s head. He gasped; his whole body trembled at a sudden sensation that frightened him, he felt the warmth leave his arms, body and heart, freezing cold seeped in, draining him. Zemia tackled from behind, latching onto him, one paw over his face and the other clamped onto his arm, heaving his hand away from the Kyrii, breaking his hold. Wiluite fell to the ground, trembling, gasping, trying to catch his breath as warmth returned to him. Suddenly, Zemia was knocked back, a powerful shockwave casting her off, sending both her and Wiluite sprawling to the ground. She recovered quickly, jumping back on her feet. Arthur twisted around, facing her. Zemia watched him closely, eyes never leaving her opponent, Arthur’s gleaming red eyes thinned into a glare. He dropped his hands to the ground. In an instant the earth started to quake. Zemia shuddered, trying to maintain her balance. Magic-infused vines burst from the soil, aimed straight for her. She jumped back as one nearly wrapped itself around her arm. Getting down on all fours, she effortlessly leaped out of the way of the vines as they flailed around, trying in vain to catch the swift Wocky. The talisman shined in the darkness with a blinding crimson glow. Zemia gasped, her arms and legs were ensnared by a group of vines that shot out from behind, yanking her to the ground, pinning her in place. Arthur chuckled. He spread out his arms, sparks discharged from his fingers, quickly forming into orbs of red-tinted lightning. Zemia clenched her eyes shut and gritted her teeth, bracing herself. Clara jumped in, tossing a handful of dirt into the Zafara’s eyes. Arthur veered, groaning in annoyance, his concentration broken, the lightning magic dispelled. She rushed him, tackling him to the ground, swiftly grasping his collar, holding him down. She had to act quickly; she reached into her belt and procured her Cobrall Dagger. She lifted it into the air and aimed straight for the crimson jewel. She let her arm fall. Arthur let out a menacing growl. He cast another shockwave, this time much more powerful than before, as it sent Clara flying. She yelped as she crashed against a tree, the force so strong, lights flickered in front of her eyes. She fell to the ground, too dizzy to react. Arthur clambered back to his feet, snarling. He raised his arms high in the air, the talisman gleamed, brighter than ever. Dark, ominous clouds materialized in the clear night sky. He spread his arms, a small opening formed in the center of the mass of clouds that widened by every passing second. Parlebb seized his chance. He rushed into the fray, drawing his sword from the scabbard. Arthur’s ears twitched at the hissing of steel, he turned to face the Yurble charging towards him. In one quick motion, Parlebb lunged and raised the katana high into the air. Clara’s eyes widened with alarm, “PARLEBB, NO!” she cried. It was too late to stop him. Without hesitation, he struck down. Steel clashed against iron. Parlebb’s sword struck the chain, the blade inches away from connecting with Arthur’s neck. The trinket tore from its host, flying into the air, vanishing into the tall grass. At once, the red in his eyes had vanished and the surging dark magic dissipated. The void in the sky disappeared almost instantly and the infused vines relinquished their hold on Zemia, withering away, withdrawing back underground. Arthur collapsed, falling over to his side. Parlebb did not lower his guard. Slowly, he approached his brother, keeping his eyes on him, sword firmly gripped in his hands. Suddenly, Arthur awoke with a gasp. He sat up, looking frantically left and right. “Arth’! Are you alright, buddy? !” Wiluite called, dashing to his friend’s side. Breathing a sigh of relief, Parlebb sheathed his sword. He stopped, as his eyes fell upon Lithia, lying still on the ground. “Lithia?” he gasped, scrambling to his feet. He ran to her side and fell to his knees. Clara rushed over as well, kneeling beside her. She placed two fingers on her neck. Seconds passed, then she rested her ear to Lithia’s chest. “This isn’t good.” she muttered, reeling back. “What happened?” Arthur said, fear rising in his voice. “I…I was under a spell?” Arthur replied, trembling. “Arth’, you don’t remember anything?” Wiluite said. “Arthur,” Clara said, “when she saw what the amulet had done to you, she…she tried to take it off you and then…it…attacked her…and…” there was hesitation in her voice, she couldn’t bring herself to finish the sentence. Arthur leaned in, feeling the side of Lithia’s neck. There was a pulse, but it was faint, and it weakened with every passing second. There are many great powers in this world and none of them are to be taken lightly. Now he had pieced it together. He may not have been able to remember everything, but it all made sense to him, what had happened after he blacked out and the dark magic took control. His heart sank; despair took over. How? He thought, how could I have been so stupid, so careless? What was I thinking, playing with dark magic? I should have known this thing was cursed! I should have thrown it off a chasm the first chance I got! Argh! This, this thing—! He reached for the talisman, only to touch the fur on his neck. Then it hit him. “The talisman! Where is it?” he snarled, his voice resonating with seething anger. He looked around, wildly, eyes squinting in the darkness, scanning the field. His eyes fell upon a glint of light, just barely hidden in the tall grass. He dashed towards it, running at top speed. “Arth’? Where are y—what are you doing? !” Wiluite called. The Yurble read his mind. He tossed his sword into the air, straight at his older brother. Arthur caught it and gripped the blade with both hands, raising his arms. He did not waste a second; he struck down, driving the edge through the very center of the dark red jewel. The trinket cracked as the blade made contact. The cracks widened, bright red lights burst from the gaps and the talisman shook violently. In seconds the ruby shattered, a powerful jolt scattering shards everywhere, disintegrating into dust. Arthur backed away and dropped the katana. He stood there for a short while, breathing heavily. 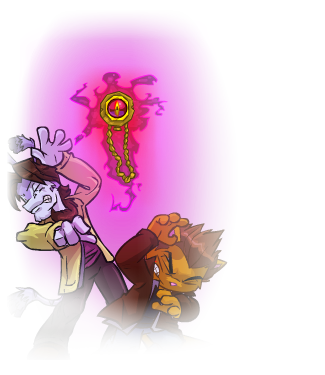 The ruby was completely destroyed, and with it, the last shred of dark magic sealed within, the legacy of the mysterious dark sorcerer who cursed it and whatever threat it could have posed to him, his family and friends and perhaps all of Neopia, gone. “Are you alright?” Zemia stood behind him, placing a paw on his shoulder. Together they rushed back to Lithia’s side. Clara had her paws over Lithia’s heart. As she focused, her paws lit up in a flickering bright blue glow. Arthur could tell she was struggling. Normally, she would rely on her healing herbs and remedies to cure some of the more serious injuries. But no herb or remedy would heal a magic strike to the heart. Worse still, Lithia was teetering on the brink and he feared it might be too late by the time Wiluite returned with the potion. It didn’t help that she was very new to healing magic. Sure, he had taught her a few tricks, but not enough to prepare her for a situation this dire. But there was a way to help. Kneeling beside Lithia, Arthur reached out. Gently, he placed his hand atop Clara’s paw and held it firmly, letting the energy flow. The blue glow intensified, as Arthur’s magic merged with that of his sister, amplifying her power. He knew he had to try. He could only hope it wasn’t too late. Lithia awoke with a gasp, panting. Her eyes slid open, she found herself surrounded by blurry figures standing over her. Moments later her vision adjusted and she could distinguish the relieved expressions of her friends and the overjoyed look of a red Zafara kneeling beside her. “That’s a relief.” Lithia smiled as Arthur helped her to her feet. Suddenly, the backdoor of the house burst open, a green Kyrii rushed over, waving a healing potion. The group turned to face him; he skidded to a halt when he saw Lithia standing on her two feet. He lowered his arms and arched his back, eyes widened into a surprised stare. “What took you so long?” Zemia quipped. Wiluite just glared at her. “You did good Wiley, she should take it, just in case.” Arthur reassured him. He took the potion from his hands and handed it over to Lithia, who drank the concoction down in one gulp. Everyone gathered around the campfire again. As they conversed with one another, Arthur breathed a sigh of relief; he, along with his friends and siblings, were thankful that Lithia was okay. Not only that, but at long last, the whole ordeal with the mysterious talisman was all over. The chatter went on for several minutes before Wiluite spoke up. “You know, I’ll say this about tonight, that was one heck of a magic show we won’t soon forget!” he said. “Good idea. I think we’ve all had enough excitement for one night.” Lithia uttered, stretching her arms, letting out a yawn. With that, Arthur and his siblings said their goodbyes to their friends. As they parted ways, Wiluite and Zemia both headed home together, while Lithia, after giving Arthur a brief hug, made her way home on her own. He watched his friends set out on their way down the dirt roads until they were just out of sight. He rushed ahead to join his siblings, only to stop abruptly in his tracks as his foot stepped on something cold and metallic. Looking down, he spotted the broken talisman on the ground. He snatched it up from the grass. He froze as he stared into the empty space where the cursed crimson jewel once was. Arthur snapped out of his train of thought, glancing towards his siblings. Clara was standing next to the back door, waving. He gripped the talisman in his hand and slipped it into his shirt pocket, heading back into the house. Arthur had just lit the last of the many candles, flooding the bedroom in a bright, flickering orange glow, just enough to cast away any trace of darkness. Clara nodded, letting out a weak groan. Arthur smiled, ruffling his sister’s hair before setting out on his way. As he made his way out of the room, one thought surfaced in his mind; now that the curse was lifted, what was he to do with the talisman now? Then, just like that, an idea came to him; there was one thing he could do. He made a stop at the desk and pulled open one of the drawers, revealing a small pile of cut stones, shells and rocks. He squinted his eyes, sorting through the collection, until he found just what he was looking for, a perfect, flawless sapphire. As he reached for it, he stopped and turned towards Clara. Arthur smirked, taking the sapphire with him as he walked out into the hallway. He closed the door behind him as gently as he could, only to come right back in moments later, leaning over the side. Clara’s eyelids slid open, revealing a pair of weary eyes. “No, thank you.” She groaned in a soft, sleepy voice. “Okay. Good night, Clara.” Arthur replied, giving her a wink before closing the door behind him. The young blue Acara lay in the comfort of her bed, encircled by the radiant light, watching the flames dance on the candles that lit up the room. The near dead silence of her surroundings calmed her nerves. Suddenly, her heart jumped and her eyes bolted open, breaking her peace of mind. It was an all too familiar noise, the sound of claws scratching against the ground at a fast frequency, growing louder, right behind her. She stirred, turning towards the window, loose branches battered against the glass pane as the wind started to pick up, the storm coming ever closer. Clara shivered, a cold sweat coursed through her as she pulled the blanket over her head, taking cover under the sheets. She was breathing in and out, trying to ease her frayed nerves as she took deep breaths. Her nerves finally calmed and her breathing returned to normal. Moments passed, she felt her consciousness slip away at last, as sleep had finally taken over. As she slept, the flames atop the candles began to flicker like mad, before finally whisking out of existence. Arthur stopped in his tracks. The door to Parlebb’s room was wide open. He could see his little brother staring at him, with his back towards the window, sitting with his legs crossed, hands clasped together and his body still. Arthur glanced at the talisman. For a moment there was silence. Then Parlebb spoke up again. “Yeah, but sometimes…I still can’t help but wonder who that sorcerer was…or what he planned to use the talisman for, or maybe…if what I saw in that pitch-black chamber was the result of him using it?” Arthur shuddered; a chill ran down his spine as an image of the skeletal Bori flashed in his mind. Arthur just stared at his younger brother. He realized there was some truth to what Parlebb had said. He sure knew one thing; they were not going to find any more answers in that haunted cavern. Just thinking about venturing back down for even a second made the young Zafara tremble. With that, Arthur stepped away from the room and continued down the hallway. But then he stopped for a second and walked back in. There was a brief pause, “Yeah, sure.” Parlebb replied. As Arthur left, Parlebb turned to face the window. His mind tranquil and at ease, his senses heightened as he absorbed the sounds of the environment around him; he breathed in the fresh nightly air through the half open window, he could hear the soft howling of the wind and the chirping of the nocturnal critters running to safety as the rainstorm closed in from afar. As the moon crept behind the cover of the clouds, the light was finally cast out. But the young Yurble did not even bat an eye. There he sat patiently as the soft sound of rain splashing on the windowpane joined the distant rumble of thunder. Strange, that appraiser back in Meridell told me the infused magic was all gone. Shows how much he knew. Yet, I know I tested it before I made the trip back home and nothing happened, but why? Why didn’t the talisman act up before? As soon as he asked himself the question, he came to a sudden realization. Maybe…the curse was triggered some other way? The dark magic, right before it consumed me…when I drew all of the talisman’s power, that must be it! It must have merged with my own magic and corrupted it, using it as a gateway to take control of me, to serve as a new host. Maybe that was the fate of the sorcerer down in that dark cavern...maybe he tried tinkering with dark magic and ended up suffering a horrible fate? Who knows what could’ve happened if the curse had stricken sooner and my friends and family wouldn’t have been able to stop me? He curled his fingers, once again burying the amulet in his hands, Well, whatever it was or could have been, it doesn’t matter now. The important thing is the curse is destroyed, and everyone is okay. Deep down he knew that was the truth. Like his little brother Parlebb had told him earlier, he could finally put it all behind him. A once dark, mystical and dangerous trinket had now been repurposed, reformed and remade. Arthur burrowed under the bed sheets, covering himself up to his neck in the warm, cozy linen blanket. He spread the rolled up copy of the latest issue of the Neopian Times and placed it on top of the fluffy pillows. He flipped through the first few pages, skimming through articles, chuckling through the comic section and absorbing each short story with utmost interest and curiosity. After a while, he rolled up the newspaper and tossed it to the side, landing on the desk across the room. He looked out the window; the clouds blocked the moon, blanketing the world in shadow. The only sounds were trees rustling and now and again the windowpane creaked as the wind picked up. Taking one last look at the talisman and the new sapphire jewel in its place, he set it down on the end table beside the bed, tucked himself neatly under the covers and went to sleep. As the night went on, the storm eventually died down, the rain stopped and the howling wind faded away, silence once again filled the air. Stray beams of moonlight shined through the window as the clouds separated and struck the talisman. The jewel gleamed; its radiance flooded the room in a bright, azure glow, to cast away the darkness for many nights to come.